In Minnesota, wind chills as cold as negative 54 degrees Fahrenheit were reported Wednesday, while Minneapolis was hit with negative 52-degree cold. This morning, Chicago reported wind chills of negative 52 degrees, while Iowa described wind chills of negative 42 degrees. ​The NWS has warned people in affected areas to cover their mouths when outside to protect their lungs from the "severely cold air." ​"Avoid taking deep breaths; minimize talking," the NWS also warned this week. "The heart of the Arctic cold has arrived," the National Weather Service's Chicago office tweeted Wednesday. "The combined effects of the cold & winds are at their peak today with wind chills of —45° to —60° continuing. The afternoon highs today…yes the highs…will only be —11° to —17°." ​In Chicago, schools were shut down on Wednesday and Thursday due to wind chills that, according to AccuWeather meteorologist Elliot Abrams, could make it feel like negative 50 or 60 degrees. That's right, weather conditions could be more frigid than Antarctica. "It's never been minus 50 in Chicago, so we can't really say it 'feels like' — nobody really knows what that feels like," Abrams said. "But you can get frostbite within four or five minutes." ​The US Postal Service has suspended mail delivery Wednesday in North and South Dakota, Nebraska, Kanas, Minnesota, Wisconsin, Iowa and Illinois. Multiple airlines, including United and Southwest, have canceled flights at Chicago's O'Hare International Airport and Midway International Airport. So far Wednesday, more than 2,000 flights into, out of and within the US have been canceled, according to FlightAware. More than 1,000 US flights have also been delayed. ​On Tuesday, Amtrak announced that it had canceled all rail service to and from Chicago Wednesday. "Extreme weather conditions and an abundance of caution have led Amtrak to cancel all train originations to and from Chicago for Wednesday, Jan. 30, including short-distance corridor trains and long-distance overnight trains," the rail service announced. 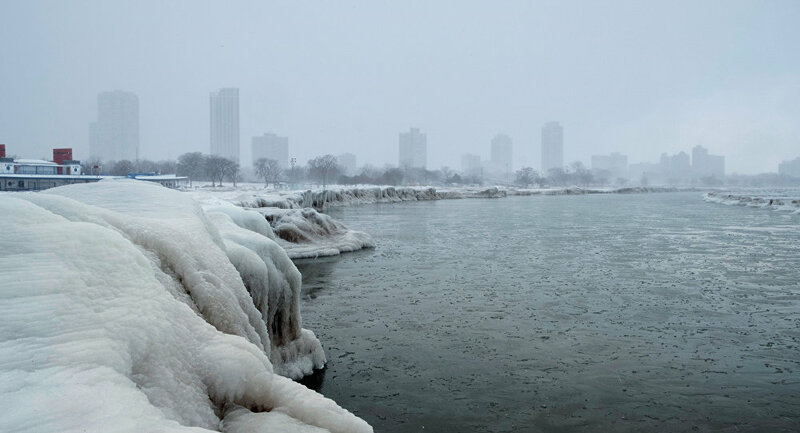 ​"The Midwest and Great Lakes are well into this Arctic blast, with dangerously low wind chills widespread across the region this morning," meteorologist Janice Dean announced this week on "Fox and Friends." "You really can't be outside for longer than minutes, because your face will freeze in these type of temperatures," she added. ​The polar vortex, which is when cold air high up in the atmosphere that usually lies over the North Pole moves down from the Arctic Circle, has already taken a deadly turn. According to the Milwaukee County Medical Examiner's Office, Charley Lampley died after shoveling snow at in his home in Milwaukee, Wisconsin. He found found frozen dead in his garage, even though he was dressed appropriately for the weather. A 22-year-old Rochester, Minnesota, resident was found dead Sunday outside a relative's home. A 70-year-old man was also found dead by police in Detroit, Michigan, on Wednesday morning. A Ligonier, Indiana, police officer and his wife were killed Monday after they lost control of their car on a snow-covered road, and a man was struck and killed by a plow truck in Libertyville, Illinois. "These [conditions] are actually a public health risk, and you need to treat it appropriately," Chicago Mayor Rahm Emanuel warned Tuesday. "They are life-threatening conditions and temperatures." Multiple warming shelters were opened Monday by agencies and nonprofit groups across the Midwest and Northeast to get the homeless population off the streets. ​"We have opened two additional 24-hour warming centers, our Garfield Community Service Center at 10 South Kedzie, and our King Community Center at 4341 South Cottage will each be open 24 hours a day," Chicago Commissioner of Family and Support Services Liza Morrison-Butler announced Monday.